If you are a fan of spring flowers such as daffodils and tulips in your landscaping and don’t have any in place, now is the time to get going with planting bulbs. Spring flowering bulbs offer a reliable colorful display just when you need it most and they require very little effort. Most bulbs are planted in late October to November once the ground has begun to cool. But if you are a procrastinator, since we are not prone to hard freezes in the Atlanta area, planting as late as Christmas or New Year is acceptable. The team at Hutcheson Horticultural loves planning and installing seasonal color at the homes and businesses of our clients but if you are more of a play in the dirt kind of person and would prefer to do it yourself. Here are some bulb planting tips. 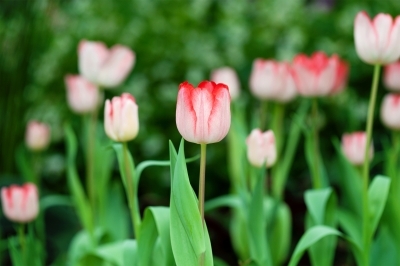 For A Natural Effect – Bulbs look best in clumps or what are called drifts. To get a natural looking effect, either dig a large area and plant several bulbs at once or simply toss the bulbs into the air and dig holes and plant where ever they fall. You’ll be surprised how well this works. Mark Your Plantings – To make sure you don’t disturb your bulbs by trying to plant something in the same spot, mark where and what you have planted. Spring Care – When your bulbs have finished flowering, cut back the flower stalks to ground level. It can get ugly, but let the foliage of your flowering bulbs dieback naturally. Resist the temptation to cut it back while still green, but floppy. The bulb needs this time to photosynthesize and make food reserves to produce next year’s flowers. To Divide Bulbs – Many bulbs spread and increase, making the original planting over crowded. If your bulbs are not flowering as well as they used to, this is probably the case. If you wish to move or divide your flowering bulbs, the safest time is when they enter their dormant period. This is usually just after the foliage completely dies back. Dormancy is brief, even though nothing is happening above ground, so don’t put this task off. To contact Hutcheson Horticultural regarding the installation of seasonal color or any of our landscaping services call us at 770-924-1001 or use the Contact Us feature on our website.